#1 If you were any more perfect, Data, I’d have to write you up in a Starfleet medical textbook. #2 Perhaps it is a human failing; but we are not accustomed to these kinds of changes. I can’t keep up. How long will you have this host? What would the next one be? I can’t live with that kind of uncertainty. Perhaps, someday, our ability to love won’t be so limited. #3 We have to dream in order to survive. #4 If there is nothing wrong with me, maybe there’s something wrong with the universe. #5 You have an appointment in your cabin, Captain, with your bed! #6 We have to dream in order to survive. #7 Perhaps, someday, our ability to love won’t be so limited. #8 Captain, I’d like to announce the birth of a large baby … something. #9 Why do captains always act like they’re immortal? #10 Now, you be sure and dress warmly on those other planes of existence. Dr. Crusher to Ensign Crusher. Aren’t you supposed to be getting a haircut, Wesley? I remember Wesley asking me a similar question when he was little, and I tried desperately to give him an answer. But everything I said sounded inadequate. Then I realized that scientists and philosophers have been grappling with that question for centuries without coming to any conclusion…. I think I’m saying that we struggle all our lives to answer it, that it’s the struggle that is important. That’s what helps us to define our place in the universe. 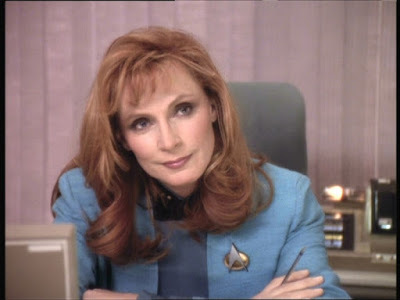 So these were the top 10 best Beverly Crusher quotes. Do share them and keep reading!